It isn't often that fans of single-screen platformers are presented with a current-gen game that can be considered an honest-to-goodness "Bubble Bobble clone"--especially one that costs just $1.99. 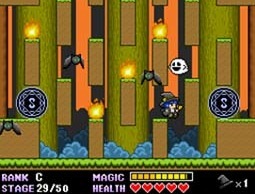 As such, one of the first things I purchased from Nintendo's eShop after I obtained a 3DS was Agetec's Magical Whip: Wizards of the Phantasmal Forest (which, it should be noted, is a DSiWare, rather than a 3DSWare, title). 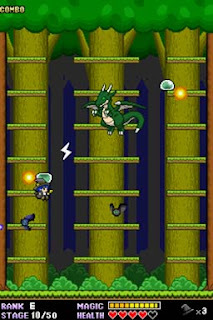 So, does this, er, dual-screened platformer (the action takes place over both of the DSi's and/or 3DS' screens, after all) bring anything new to the genre made famous by Taito's classic quarter-muncher, or does it basically just trade on nostalgia? I'd say the answer's a little of both, if that makes sense. What I mean is that, yes, Magical Whip is, initially at least, aimed at those of us who have enjoyed games like Bubble Bobble, Don Doko Don, Rod Land and Snow Bros. It quickly becomes apparent, though, that the team that made this digital title wanted to do more than just copy those aforementioned trailblazers. Magical Whip's juggling mechanic and combo system aren't the only thing that help separate it from the pack. Also noteworthy: The fact that the action takes place over both of the DSi's and 3DS' screens. Admittedly, it doesn't significantly change the gameplay, but it alters it just enough to make things interesting. As for this title's negative aspects (you just knew they were coming, right? ), the main one, in my mind, is the repetitive backdrops. 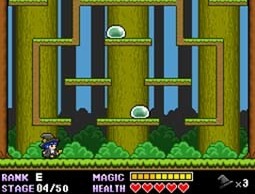 I know the game's subtitle is "Wizards of the Phantasmal Forest" and, as such, most if not all of its levels should take place in wooded areas, but couldn't the designers have changed the look of the trees every five or 10 stages? Also rather disappointing is the game's limited number of enemy designs. If Magical Whip were a retail release, I'd complain that it includes 50 measly levels, but since it's a two-dollar digital one I'll forgive that particular transgression. The "two dollar" part of that last sentence is perhaps the most telling part of this review, by the way. Basically, if you consider yourself a fan of Bubble Bobble and its ilk, there's really no reason to pass up Magical Whip if you own a DSi or 3DS given its minuscule price tag, as its few miscues are easily overlooked when you consider just how few pennies you have to hand over to buy it. Looks fun! Is it in 3D? That would be something you can't get from Bubble Bobble. Unfortunately, warp, it's not in 3D, as it's a DSiWare title and not a 3DSWare (or whatever) one. Still, it's worth picking up if you like this genre and have a few bucks to blow. The price made me put it on my wish list, but this review might make me buy it after all. Really, Justin, you can't go wrong if it's just $1.99, right? Especially if you like the genre. It's been on my WishList since it was released, but I forgot it existed. Thanks for the reminder, Bryan! I'm going to buy it this weekend. Can't go wrong for the price.